This project, funded by the LabEx BCDiv (ANR-10-LABX-0003, MNHN, France), and which has received the agreement of EWCA on 13th November 2017 and of Prof. Afework Bekele (Addis Abeba University), aimed to collect rodents, shrews and bats around the Goda Buticha archaeological cave (Eastern Harerge region; Chelenko district). For a better identification of the Late Pleistocene to Holocene fossils of small mammals collected during the excavations in this cave site (South East Ethiopia Cave Survey project) (Stoetzel et al., 2017), it became necessary to establish anosteological collection reference of genetically typed specimens in order to 1/ document the poorly known modern small mammals diversity in the area and 2/ compare their morphology with those of the fossils corpus recovered in the Goda Buticha and Porc-Epic cave sequences. For that, we explore various habitats and put Sherman traps and mistnets to catch small mammals in both natural and anthropogenic habitats. 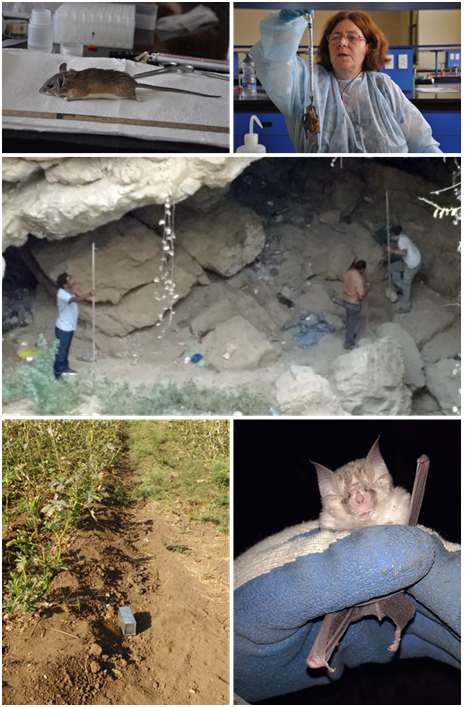 Some of the sampling lines were situated very close or inside Dire Dawa and revealed an interesting bat diversity. 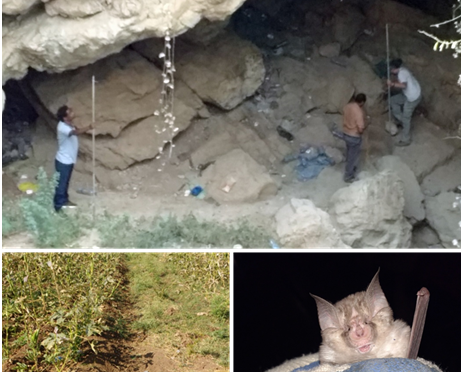 The cultivated and rocky areas in Acacia woodland were also sampled close to the Goda Buticha cave and allowed to recover some rodents and bats that will be studied in the Museum of Paris and for which molecular and morphometrical analysis will be performed. The biodiversity of the small mammals in the Dire Dawa region is poorly known and it is highly possible that we will add new species for this area. As a result, we collected in total 31 specimens including 8 bats and 23 rodents. The general trapping success was low comprised between 0 and 17.5 %. Moreover, some of our traps were damaged during the night by hyenas or jackals. However this low trapping success is balanced by a relatively high diversity with 6 and 5 genera for rodents and bats respectively. This study was made just after very abundant and exceptional rain season which may explain a relative low trapping success. The absence of the multi-mammate rat (Mastomys) into houses and cultivated areas is challenging. In the open dry areas, we should have found some representatives of the Gerbillinae but this was not the case. We interviewed people in the villages who indicated the use of rodenticides as well as the presence of cats. People also indicated the large size of the rodents they found into houses which means that the smaller multi-mammate rat (Mastomys) may have been eliminated by competition with the black rat (Rattusrattus) or even the grass rat (Arvicanthis). Finally, the bad state of the roads prevented us to perform more intensive trappings. However we have identified different habitats that should be explored in a near future. For the moment, on the eight rodent species that we captured we can compare them with four of the fossils recovered into Goda Buticha archaeological cave in Late Peistocene-Holocene levels. At least for these taxa we hope to precise the fossil identifications at species level and infer a better palaeoenvironmental reconstruction of the site. For the bats, the Goda Buticha cave yielded few fossils specimens but our new findings will allow their identifications. Thanks to the Dire Dawa University and its Vice-President of Research as well as the Dean of Science faculty and the director of the Biology Department we have been able to use the Natural History Laboratory for our work and we have presented two conferences on the 30th November 2017. Christiane Denys made a conference on the application/implication of paleontological studies in the recognition of the modern and past small mammals diversity of Ethiopia. Following Christiane Denys’ presentation, Mohammed Kasso talked about the different aspects of the general interest of bats and their study.